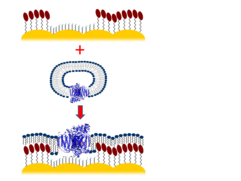 Interactions of proteins and peptides with biological membranes are essential for a variety of biophysical and biochemical processes, including energy transduction (see Biological electron transfer reactions), signaling, or transport processes. To understand molecular details of the underlying membrane-confined processes, we are using membrane models that are able to mimic essential features of the natural template but are sufficiently simple to allow for applying highly sensitive spectroscopic techniques. Particularly convenient models are tethered bilayer lipid membranes deposited on thin Au films, which act as amplifiers of spectroscopic signals (SEIRA spectroscopy) and as the working electrode for applying potentials across the membrane. These devices are used to monitor potential-dependent processes of the integral and peripherally bound proteins, including redox proteins and channel proteins. 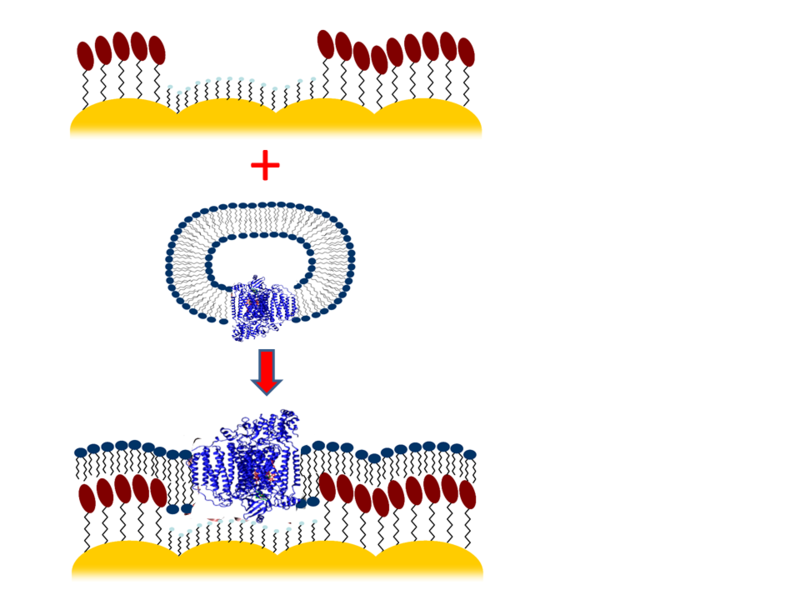 Another intriguing application of this approach we are currently focusing on is dedicated to analyse the action mechanism of antimicrobial peptides with membranes. Wiebalck, S., Kozuch, J., Tzschucke, C., Jeuken, L. I. C., Hildebrandt, P. (2016) A novel tethered bilayer lipid membrane tailored for the IR spectroscopic investigation of membrane proteins: monitoring catalysis of cytochrome cbo3 (2016) J. Phys. Chem. B, 120, 2249-2256. Kozuch, J., Weichbrodt, C., Millo, D., Giller, K., Becker, S., Hildebrandt, P., Steinem, C. (2014) Voltage-dependent structural changes of the membrane-bound anion channel hVDAC1 probed by SEIRA and electrochemical impedance spectroscopy, PhysChemChemPhys 16, 9546 – 9555. Kozuch, J., Steinem, C., Hildebrandt, P., Millo, D. (2012) Combined Electrochemistry and Surface-enhanced Infrared Absorption Spectroscopy of Gramicidin A Incorporated into Tethered Bilayer Lipid Membranes, Angew. Chem. Int. Ed. 51, 8114-8117. Current collaborations: M. A. Mroginski, TU Berlin; R. Süßmuth, TU Berlin; C. Steinem, Univ. Göttingen; T. Gutmann, FZ Borstel.